Steering Committee to Get Serious about River Fix? UPDATE: The images below were created by mirrorpond.info, a site run by Old Bend Neighborhood Assoc. They were not created by the Mirror Pond Steering Committee, as originally reported. 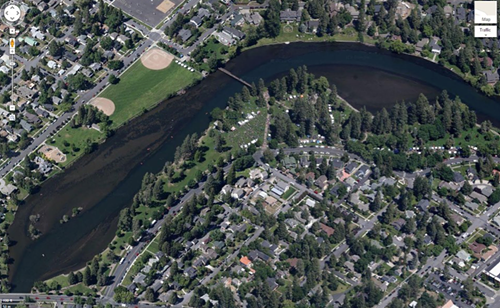 The Mirror Pond Steering Committee (MPSC) mirrorpond.info just posted the following images, depicting the Deschutes River NOW and what it COULD look like as it flows through Drake Park. Dramatic change. Wide, warm and shallow makes for an unhealthy river. A more narrow channel means deeper, faster, colder water. Better for river health and better for the community. 1) Look! It's (closer) to a river again! Closer to appearing as it does upstream, flowing through the Old Mill. A move in the right direction. Long term solutions! River health! Science over sentiment! 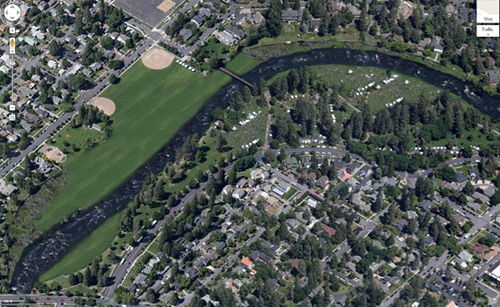 2) The overhead image of the river in its current state (the first one) is appalling. Now we can see JUST HOW BAD IT IS. 3) But look at all the added green space in the second image. That's more land for parks, picnics, Frisbee, walking, date nights, softball, foam sword battles, impromptu concerts, dog walking and cartwheeling. (If you're struggling to get your bearings, note the bridge spanning the river in both images. That's the wooden walking bridge at Drake Park. Also note the softball fields by Harmon Park on the westside of the river). To catch up on the current state of the Deschutes River and what the options are for the river at Drake Park read our news story, "Blowing the Dam."